Because of these daily worries, I occasionally document my teaching outfits to reflect upon and otherwise make sense of that day’s sartorial strategy. Unfortunately, I can no longer snap a quick photograph on my MacBook Pro’s Photo Booth (the camera is dead). 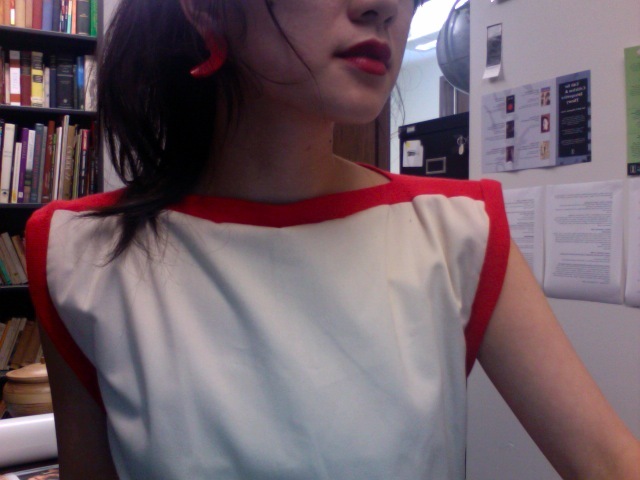 Instead, here’s an archival photograph of my go-to First Day of Teaching Outfit from the last several years. I usually wear black to add a touch of stern scholar to the usual administrative rituals of the first day, but this year, because of the warm weather, I paired the knee-length skirt and unseen black kitten heels with a vintage ’50s silk blouse in a abstract pattern of bright pastels and a large white enamel modernist-style pendant. I am considering chopping the long hair (which is usually in a ponytail for convenience) in favor of a more severe, but also crazier, cut, but I’m not sure this small college town can sustain this desperate desire with adequate hairdressing. Last week I had my students discuss the Sartorialist’s photograph of a “surprisingly stylish” homeless man — though as several of my students noted, since Sart did not actually speak to the man, we have no evidence that he is actually homeless. “My grandpa would totally leave the house with shorts over sweatpants,” one or two argued, adding, “My grandmother hates it when it does that.” The class was quick to move on from the familiar effort to imagine a different interior life for the man pictured (“He probably has better things to worry about!” is itself an assertion of what is valuable and proper) to recognize that in doing so, they would also be presuming to “know” him based on no evidence. We deny him a more complex personhood when we name this man as exceptional among the homeless because he matches or layers and thus exhibits dignity, or otherwise portray him as “just trying to survive” absent of dreams, desires, or even so-called deviancy. This is one of the important lessons of the course so far: the stories we create around persons from their clothes often say more about us, and about the larger social, political, economic discourses and practices that inform our world-views both consciously and unconsciously, than about the persons we are looking at. An obvious F.Y.I., posting will continue to be wildly irregular from both of us until this fall, when I will be teaching my course, Gender and Women’s Studies 490: The Politics of Fashion, again. I’ll post at least once a week about this upper-division undergraduate seminar, to track the ups and downs of teaching that beauty and fashion are significant vectors of power. I’ll be testing out new readings and assignments, including alternatives to the traditional seminar paper that might involve, say, a video ethnography of a mall (with references to Marianne Conroy’s essay “Discount Dreams” on the outlet mall, Meaghan Morris’ “Things to Do With Shopping Centers,” or Elaine Abelson’s When Ladies Go A-Thieving on middle-class women shoplifters in the Victorian era), or an art project along the lines of The Counterfeit Crochet or Emily Larned and Roxane Zargham’s Lookbook 54, both fascinating commentaries on fashion’s tensions between handmade luxury and homemade innovation in the first, and “traditional” standardization and temporary individualization in the second. Hell, I would also enjoy some sort of real-time performance piece, like The Grey Sweatsuit Revolution! Meanwhile, I’m enjoying Tricia’s thoughtfully composed query, “Would you wear garbage?”, which is necessarily caught up in issues of “choice” and perceptions of value (including self-worth, whether one is invested in “I deserve only the best” or “I am a good person for being green and ‘recycling'” or whatever), over at Bits and Bobbins. Former sales associate Dulazia Burchette claims that she was twice sent home to re-dye blonde highlights to a color she was “born with” before finally leaving A&F. According to the complaint, at least one other African American employee with nonconforming hair color was fired, another was allowed to work only in the stockroom until such time as she could dye her hair, and a third chose to wear a black wig. Caucasian employees’ hair color and highlights were allegedly not subject to similar scrutiny. Oh, Abercrombie, you never learn! I sure hope the New York Times is right — that you’re losing your “cool” at the mall, and taking a hit in the corporate pocketbook. Lastly, I want to note that Minh-ha bought the Alexander McQueen tuxedo jumpsuit she fawned over here, and has successfully worn it to rave reviews! There’s nothing like the start of the semester to make you totally not care about regular blogging! However, today a student approached me after class to tell me that my dress was totally “awesome,” and how I didn’t dress “normal for a teacher.” I guess that’s good? More exciting than my dress, which is futuristic in the way that only the ’80s can be, are my boots, which make me think I should get myself a steel tiara with a red star, a la Wonder Woman.